I have been intrigued with design thinking for some time. Several years ago, we visited Shattuck School’s (Faribault MN) We Create center. School leaders shared they had created their learning space (oh my it was wonderful) using the design thinking process. Last year, we took a trip to the Mayo Clinic Center of Innovation and I learned how they were using the concept to create innovative products/processes/systems/spaces to better serve their patients Their motto – Think Big, Start Small, Move Fast. 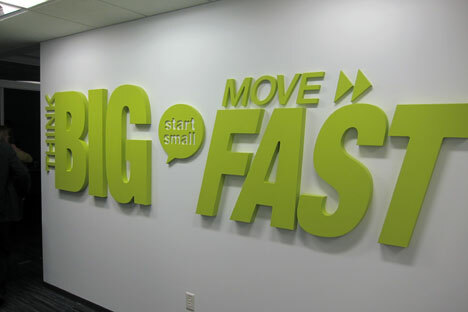 Think Big, Start Slow, Move Fast! – Mayo Clinic Center of Innovation’s motto! What I love the most about design thinking, is the human-centered approach. Through empathy interviews and observations, teams define problems (some not clearly visible) and ideate solutions based on those findings. Then, create a prototype of a solution to test with customers. This process is utilized by all types of companies/organizations – from health care to entrepreneurs. This fall, I am an adjunct prof in a graduate level course called Real World Learning Design. Realizing that companies/organizations were using this methodology to innovate and solve problems (or create new products) – I wondered – could I embed this methodology into my course? 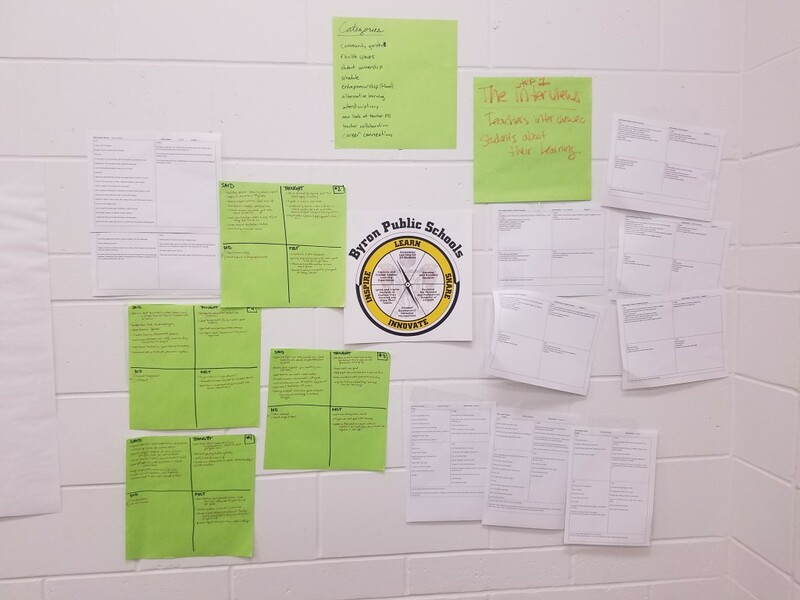 I learned that schools were using the approach to redesign learning spaces. Could the same process be used to redesign learning? After all, shouldn’t students be at the center of our instructional design? So, I did ton of reading over the summer. First with Tim Brown’s book Change by Design, then with John Spencer and A.J. Juliani’s book Launch. I curated a huge bookmark folder of online resources and lurked #DTk12chat. Then I stumbled on Stanford’s d.school’s Crash Course and other materials! 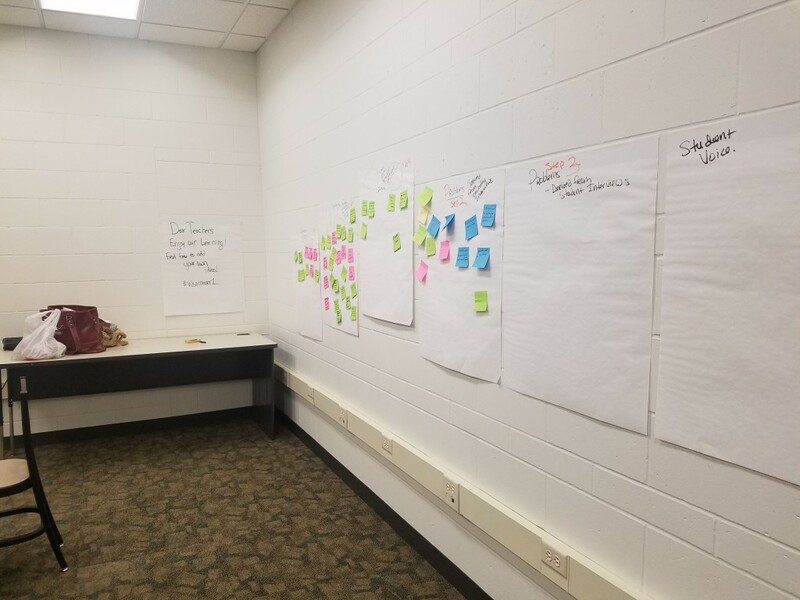 Having never participated in a design thinking experience, this provided an excellent roadmap to applying it into my course. (not just as a facilitator – but as a learner with my students!) Did I mention they have a creative commons license on their materials? Thank you d.school! The past 3 weeks, my students (teachers) completed empathy interviews with their students around learning. The key point to empathy interviews, leave your assumptions and bias at the door. You need to go into the interview with a “beginner’s mindset” and not lead students into answers. Teachers also observed their students outside of their classroom . It was eye-opening for some of my teachers to go into other classrooms and to watch their students. 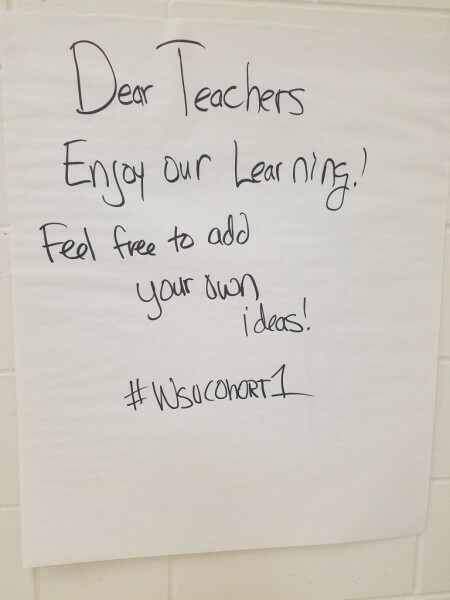 For some, they might be more engaged in one classroom – for others – maybe there was an obvious disconnect. Led to questions… Why? Fast forward to tonight. As the stories came out, it was apparent we had quite a few common themes in all of the interviews. (From grade 2 to high school) The first pic below is what we found as common themes. First F2F day, my students need collaborative time to create questions. (maybe at least 4 common questions). On the second f2f day, I need to create time constraints. 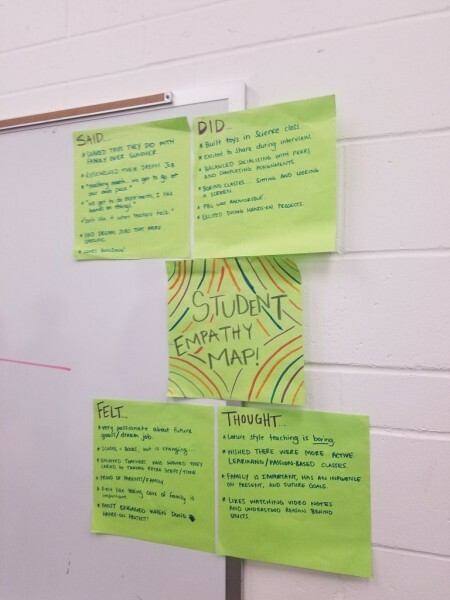 We probably spent too much time sharing our empathy maps/findings when we could have spent ideating and creating solutions. I would also like to explore different ideation strategies. We also did not have time to go in and refine, refine, refine. I need to either bring norms to the table OR create norms with the class. Like – No “Ya Buts” when ideating. Have signals for when people do so. When other ideas emerge – let people go off and work out ideas. I love the new “learning lab” space in our HS. I think we should consider making it even more collaborative and functional. One of my big aha’s is how design thinking is directly correlated with all of the Innovator’s Mindset characteristics. 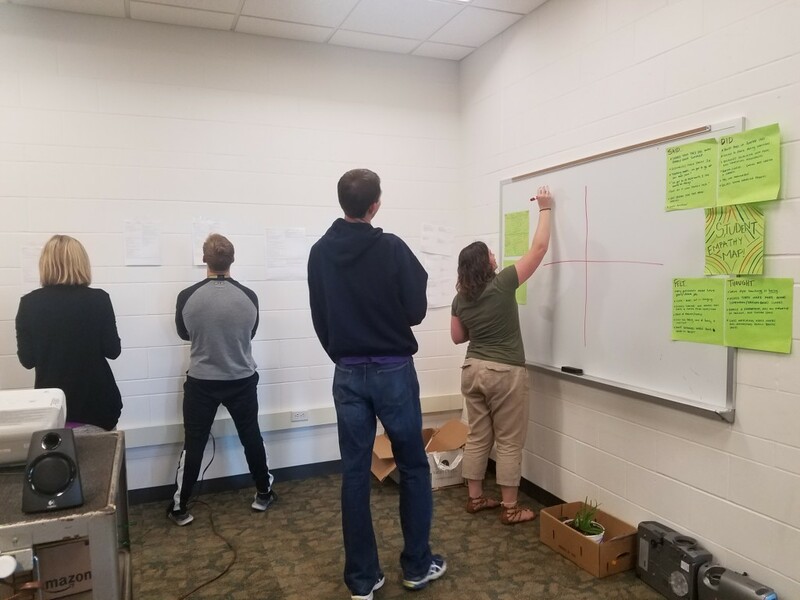 I feel I have a deeper understanding – especially the traits of empathetic, observant, and problem finders after this teaching/learning experience. Teachers will be designing and implementing learning experiences based on their definition of real world learning. They also will have an opportunity to take what they learned through their empathy interviews and implement (their learning design prototypes) within their students. They will collect student evidence of learning, get feedback and analyze and present their results. I can’t wait! Overall, I am very satisfied with the turnout. Could it be better – absolutely! I will definitely be using again in my next course – Innovative Instructional Leadership. 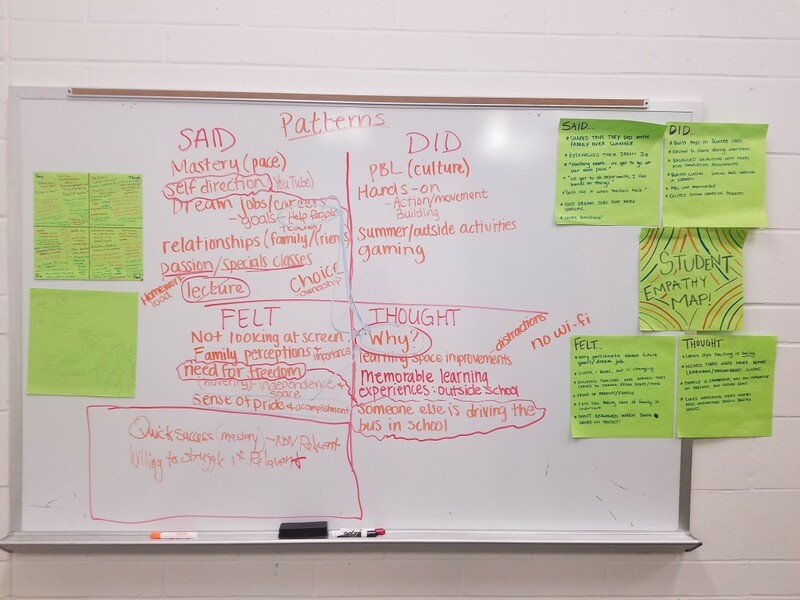 Here are a few of my student’s blog posts after going through the empathy interview process. What I value the most about these posts – is their thoughts and desires to get to know their students better, to build upon teacher:student relationships and design better learning student-centered experiences. 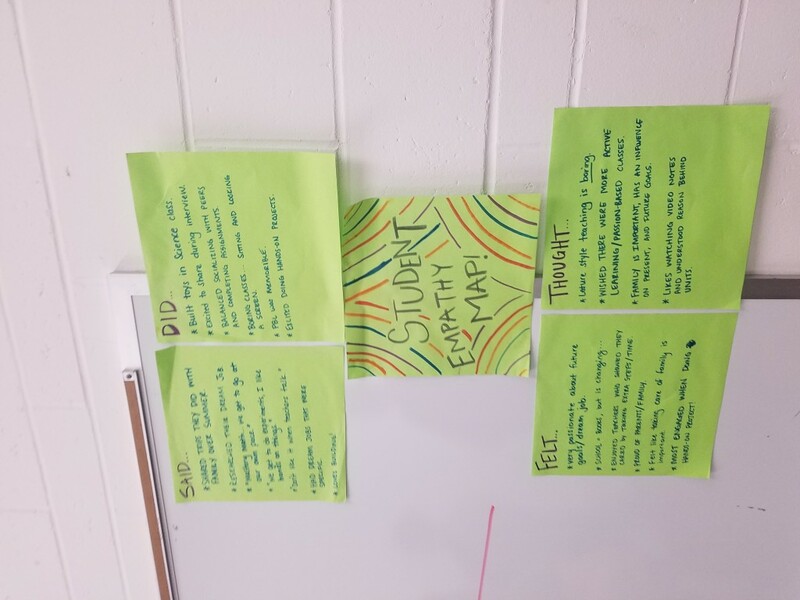 One last note, since my cohort actually meets in my school – we decided to leave all of our materials up for our other teachers to see and invited them to share their ideas. (with post-its and all!) The more transparent we can be with our learning, the more opportunities there are for everyone to learn! 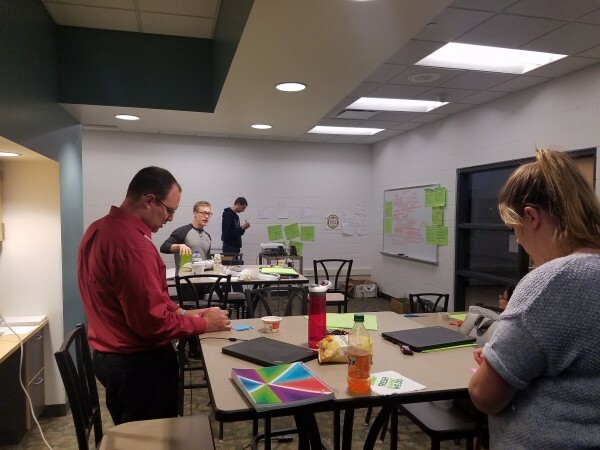 This entry was posted in Innovation, Real world, WSUCohort. Bookmark the permalink. This is a very intriguing process… something I’d like to learn more about. I bet it was very eye-opening for the teachers to see students if different contexts. Thanks for sharing the experience!